Waterlogging also led to traffic snarls at major junctions like Rasulgarh, Bomikhal, Vani Vihar and Nayapalli. 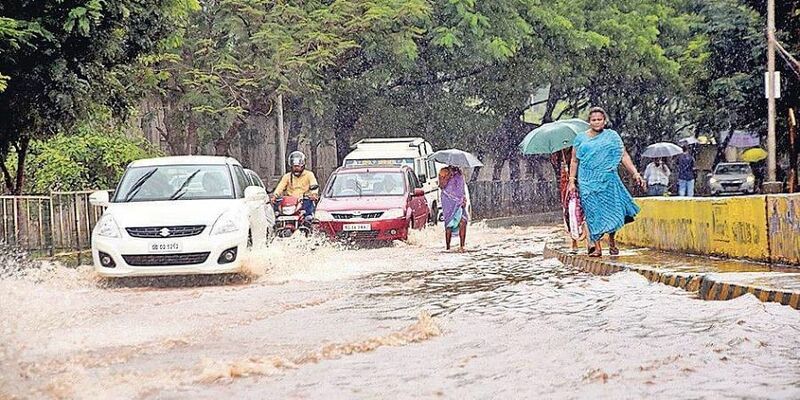 BHUBANESWAR: The State Capital reeled under the waterlogging menace once again as heavy rain lashed the City on Friday. Several low-lying areas including Gouri Nagar, Lane-10 in Sriram Nagar, Mallick Complex in Jagamara, Behera Sahi in Nayapalli, Nandan Vihar, Paika Nagar, Jaydev Vihar, Acharya Vihar, VSS Nagar and Mangala Mandir Lane in Chakeisiani were left inundated after the rains. Waterlogging also led to traffic snarls at major junctions like Rasulgarh, Bomikhal, Vani Vihar and Nayapalli. Vehicles were left stranded for at least an hour on Rasulgarh-Bomikhal stretch as rainwater flooded the entire area. Arjun Behera, a resident of Behera Sahi, said the drain water from IRC Village, Rental Colony and Indradhanu Market discharged into Behera Sahi led to flooding in the area. This has become a regular affair during heavy rains, he rued demanding a separate drainage system for Nayapalli. Jagannath Basti residents, who were recently relocated to Pandakudia and later provided shelter at Madhusudan UP School in Shyampur till the threat of the heavy rains subsided, said they had already started construction of their makeshift homes, but after the downpour, the entire area had become muddy. “After heavy rains, Pandakudia area was filled with dirt and we had to move through the muck gathered near our makeshift houses,” a physically-challenged person Kamadev Digal said. The stormwater also entered the houses in Jaydev Vihar and the residents had a tough time to save their valuables from getting damaged. Meanwhile, the Bhubaneswar Municipal Corporation (BMC) authorities have received 37 complaints of waterlogging from Thursday to Friday. While Bhubaneswar Operations Centre (BOC) received 26 complaints of waterlogging, BMC Storm Water Control Room registered 11 complaints. Odisha Fire Service’s pumps were installed at 14 places in the city, while BMC had set up pumps at seven locations to drain out rainwater.